In the MelePC review published earlier this year, I mentioned that the PC is not dead yet – it’s just shrinking until it almost disappears from view behind your monitor. 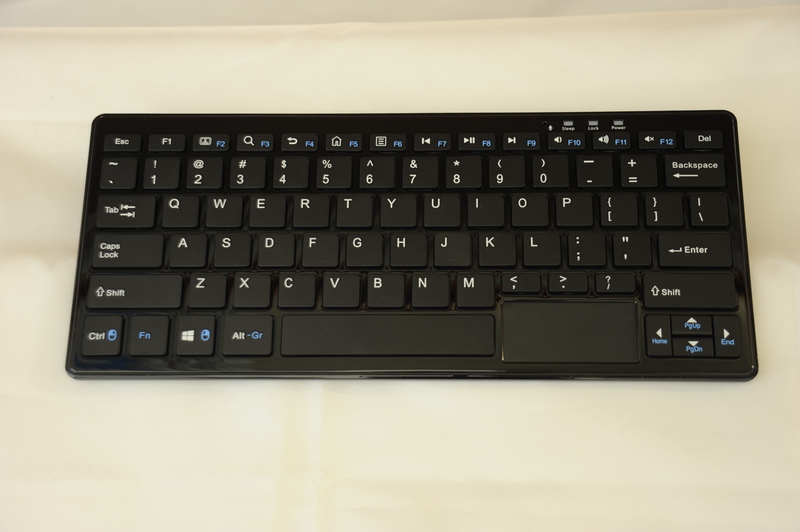 This came home to me again the other day when I came across a mini-size keyboard at a HK trade-fair that appeared to be connected via a HDMI cable to a screen running Windows 10. Since you’d normally expect a keyboard to be connected to a PC via USB, I peered behind the screen, and found that there was absolutely nothing hiding behind it at all…what was going on here? 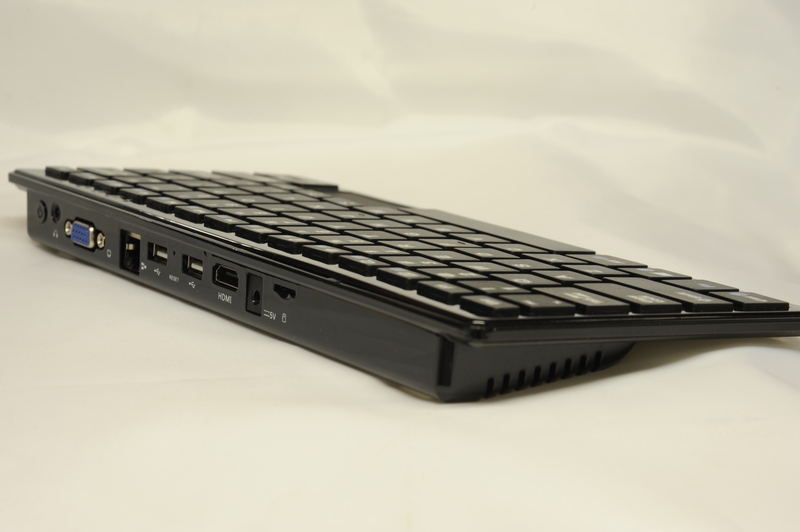 On the back of the tiny keyboard, I was surprised to find all the ports you’d associate with a full-fat PC – two display outputs, two standard-size USBs, RJ45 network and headphone/speaker sockets, a card reader, a tiny reset hole, and a power switch. 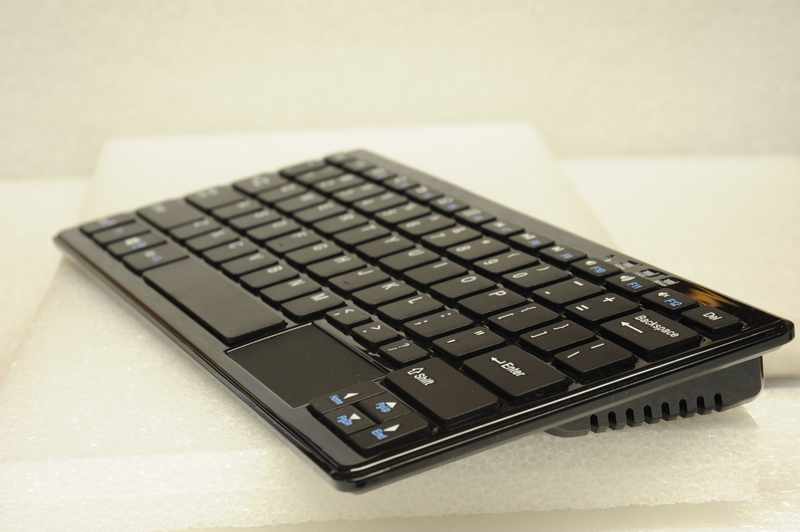 The front of the keyboard sports a trackpad on the bottom-right, and playing with that confirmed that a single-finger-tap made a left-mouse click, whilst a two-finger tap made a right-mouse click. Questioning the sales staff determined that this was yet another variation of the Intel Atom Z3735F 1.33GHz quad-core PC, with 2GB of RAM, 30GB of solid state storage, running Windows 10. You’d never guess it’s hidden nature when casually looking at the keyboard from above, as it made no noise and gave off no obvious heat. In addition to the HDMI monitor cable, there was only a single skinny power lead going to a 5Volt 250mA wall-wart power supply – networking was done wirelessly. Once I got my hands on a unit locally, I found the top of the Aiwa‘s keyboard is simply clipped all round it’s perimeter to the base, and can be opened with a determined fingernail to reveal the PC board inside. 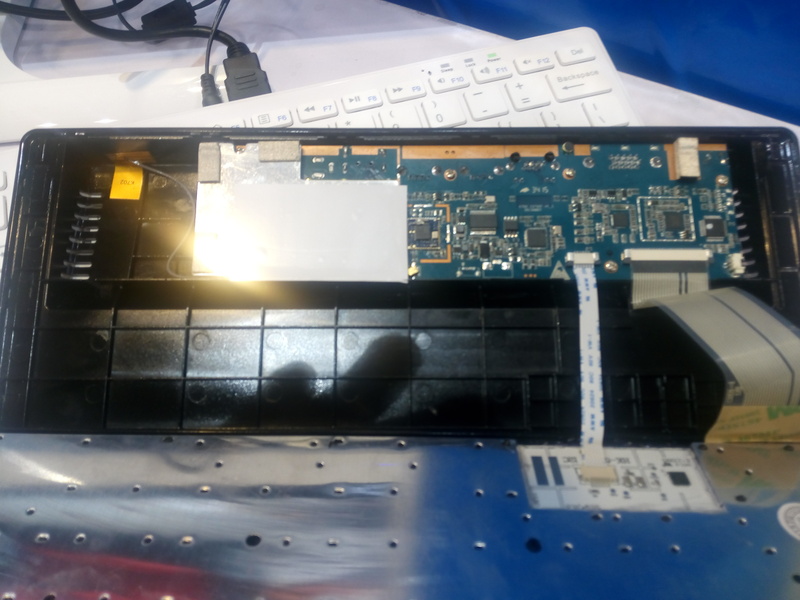 The underneath of the keyboard itself has a metal shroud, and is connected by the thin ribbon cables you see in the pic above. The left ribbon is for the trackpad, the right one is for the keyboard. 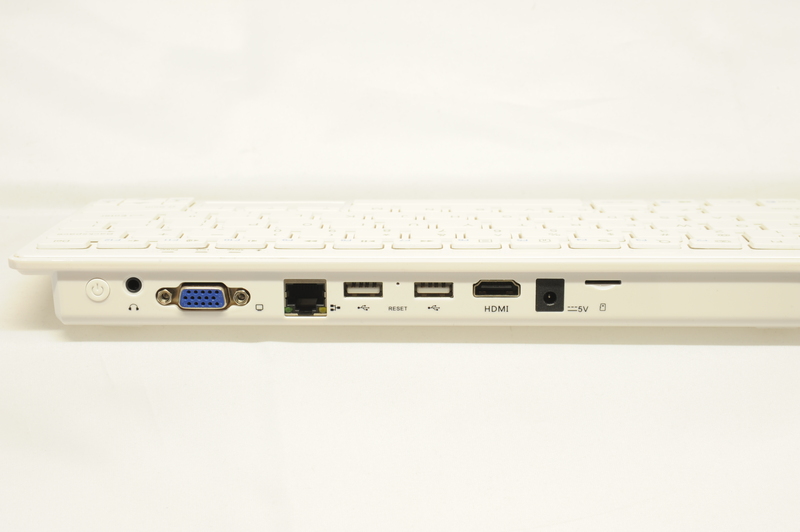 The PC is entirely contained in a single printed circuit board (PCB) that includes 802.11 WiFi and Bluetooth 4.0, in addition to all the ports visible at the back. There’s a WiFi antenna wire just visible on the top-left. Some vents on the sides of the plastic base allow for passive cooling, although I suspect the metal shroud acts as a heat-sink to help with keeping it cool also. I’ve connected both a HDMI and a VGA monitor to it at the same time, and after a reboot, Windows offered to extend the desktop to both screens @ 1080P (1920×1080) resolution, which makes them ideal for office use. 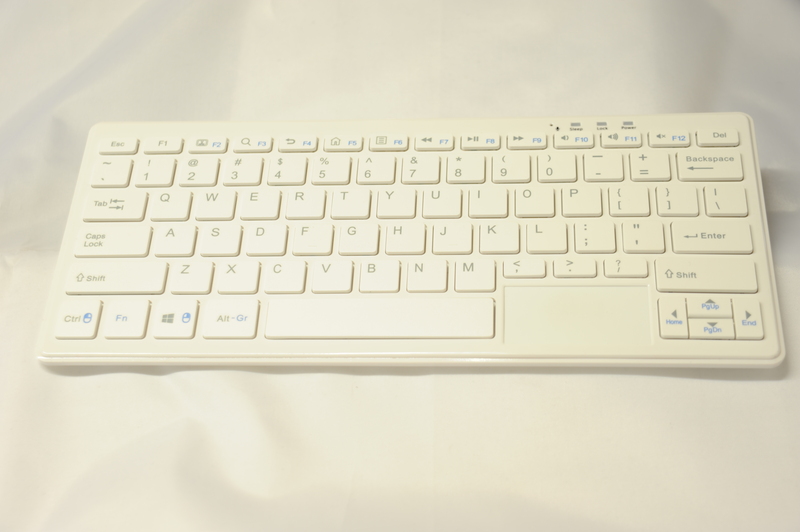 The keyboard itself has a Function key on the left-hand side that enables the left Ctrl and Win keys to act as physical mouse buttons, and a series of media functions are enabled by the function keys across the top. Some LEDs above F11 tells you if it’s powered-on or sleeping, and if CAPS-LOCK is on. There’s even a microphone to the left of the LEDs – it has no speakers though, just a 3.5mm headphone/speaker socket. But, if your display has speakers, you can also get the audio out via the HDMI port. That’d make it a decent workstation for use with IP Phone software, or Skype. There’s also a bunch of arrow keys to the right of the mouse that double-up as Home/End and PageUp/PageDown keys. Click the pic below to zoom in on all the keys. 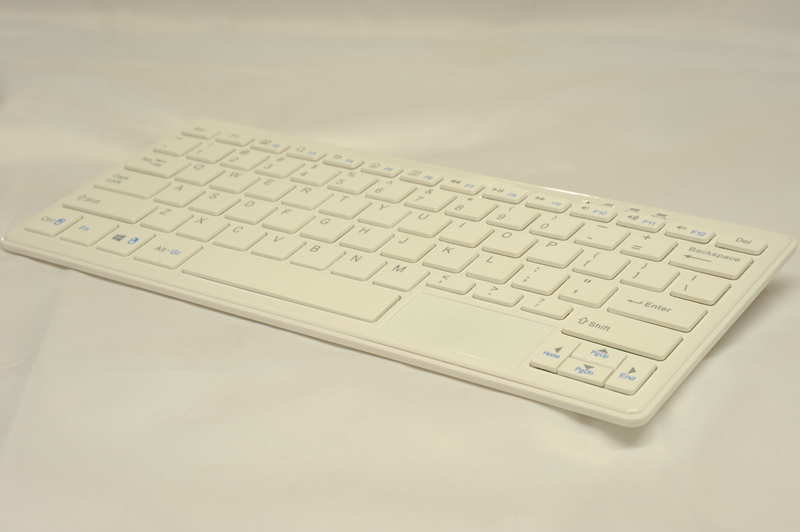 The key-press feel is similar to a laptop keyboard. If you need more space, you can map a network drive, connect a USB drive to one of the USB2 ports, or plug in a MicroSD memory card (same as used by Android phones). The card reader can read/write to MicroSD memory cards without needing an adapter, which is handy if you want to work directly with a card pulled from a phone. Is this a proper PC? Performance-wise, these Atom PCs are capable desktop replacements. Booting up in 5-7 seconds, the Aiwa came with a ready-to-use Windows 10 desktop install, licence already activated, and around 20Gb of free space. All you need to do is connect your Microsoft account to personalise it. The free space on the solid-state disk reduced a lot once I ran Windows Update and sucked down the November update that essentially installs a new version of the O/S – manually running DiskCleanup restored almost all the space, though. There’s no pre-installed crapware to remove, or bundled freeware apps – it’s vanilla Windows 10, ready to work, and can do pretty much any regular desktop jobs that don’t require serious 3D video acceleration. If you are a travelling tech, this could be a cheap alternative to a laptop. 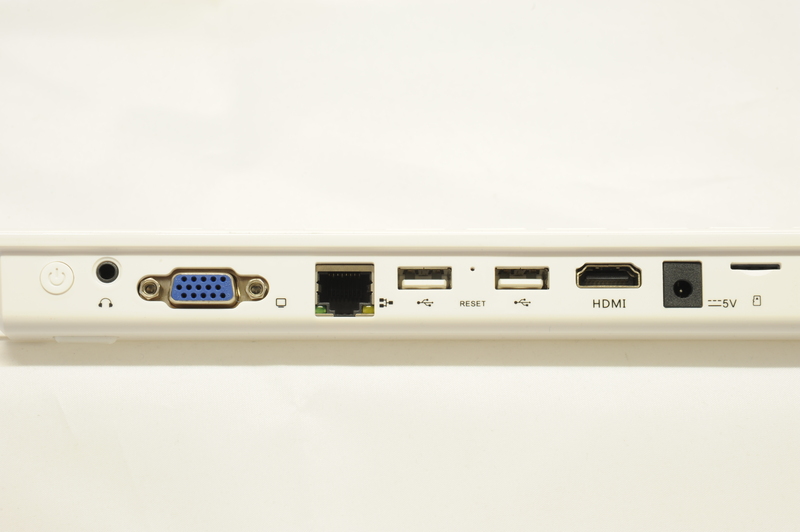 If you want to set up a budget digital signage system behind a TV panel, it’s perfect for that too, and the built-in keyboard and mouse will save you time when you need to physically access the PC. 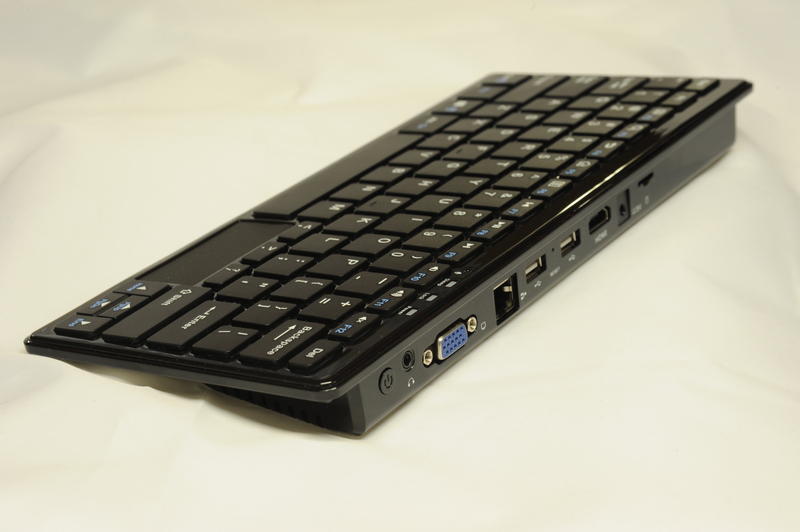 For all the other uses you can put it to, have a read of the MelePC review, which covers using these miniPCs as media centres, remote-desktop replacements, and so on. A Windows 10 Home licence sells for $160+ from high-street stores in Australia – the Aiwa is just $100 more, delivered. For that, you get a desktop-replacement PC, capable of dual-display, with most of the connectivity found in laptops and high-end tablets. It’s around the same price as the Mele miniPC, but you get a keyboard and mouse with the Aiwa miniPC, which makes it better value still. It’s available in black or white here. This entry was posted on December 10, 2015, 11:01 am and is filed under Mini PCs. You can follow any responses to this entry through RSS 2.0. You can leave a response, or trackback from your own site.